This week there are many players in the UK anaerobic digestion industry who have been blogging and sending out news releases complaining about the UK government's continuing reductions in the taxpayer subsidised UK Feed-in Tarrif (FiT). This is an additional payment which approved AD Plant operators are guaranteed to be paid, in addition to the normal payment per kWh, for their renewable biogas energy generated electricity. It really is not news that the biogas plant capacity which will be granted at a preferential FiT, is being progressively reduced. So, the only aspect of that might be seen as "news" is the way in which the FiT is being reduced, through technical aspects of the way it is being handed out. FiT allocations are being dribbled out in batches every 3 months by the government department responsible (DECC), and each time they open the doors for new project submissions, the budgeted FiT allowances are being taken up in a matter of minutes. Is it any wonder that a government desperate to save on public spending, will seize on that indication, to assume that the industry is healthy? 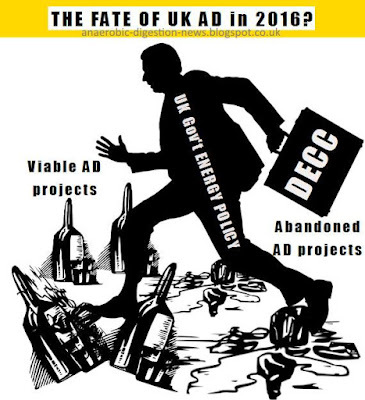 With so many backers of the anaerobic digestion process clamouring to develop projects and apply for FiT payments, the Politicians must be assuming that the UK AD industry can hardly fail? UK Anaerobic Digestion Plant Promoters Should Stop Complaining! The view from this blogger is that there are many other ways to sell the biogas energy produced by biogas plants. Producing electricity is only one way to monetize biogas energy! It is accepted that other methods may often, but not always, require additional investment in cleaning up the raw biogas, before these alternative markets can be supplied, but these new products can command higher payment. They also waste less of the energy, and can therefore be more environmentally sustainable. The best alternative for many is biogas upgrading which can be done to a variety of quality specifications, with the most stringent being for injection into the natural gas supply grid. Upgrading technology to do this has improved hugely in the last few years, and the market for renewable compressed natural gas (CNG) is one that is insatiable. At least cannot be over-supplied within current forecasts for biogas feed-stock availability, so why complain? simply accept reality, and like most of the rest of the world, get on and live with it! The following is a round up of a sample of the complaining articles I refer to. Come on AD'ers. Stop moaning and live with it! “The FIT deployment cap of 20MW per year for AD is already constraining much needed baseload capacity, failing to recognise our industry’s ambition. Not rolling over unused capacity from one tariff period to the next is salt in the wound and a shocking waste of MWs worth of renewable electricity which DECC has already accounted for. The new FIT scheme has quarterly “caps” on maximum deployment for each technology, which are set at 5MW for AD. An application for a plant that breaches the cap is counted towards the next quarter – but any capacity unused is simply lost. The industry needs to stand-back from all this, and realise that it the UK Referendum on 23 June, results in the UK leaving the EU, the power of Prime Minister Cameron will be greatly diminished and in that case the Department of Environment and Climate Change will probably be very quickly closed down. The UK Treasury clearly would like to close DECC, and Cameron is surrounded by politicians who are openly antagonistic to subsidising energy (with some holding no sympathy at all with those that seek to limit climate change), so what chance would this department then hold of even being around to hand out any FiTs at all? It would be much better for the UK AD Industry to accept reality and concentrate on produce other alternative biogas energy products and market their renewable energy into those markets. Electricity production is after all, a wasteful use of this valuable energy, and with transmission losses etc., only about 30% to 50% will ever reach the consumer. Baseline electricity supply 24/7 is important, but can be supplied by a myriad of small peak load shedding diesel generators located at the premises of the main power users. The UK government is subsidising those installations. It will potentially be able to extend those programmes much more cheaply than adding nuclear power stations. So, stop whingeing UK anaerobic digestion project promoters! Get on with taking the next leap into CNG / biomethane production now!